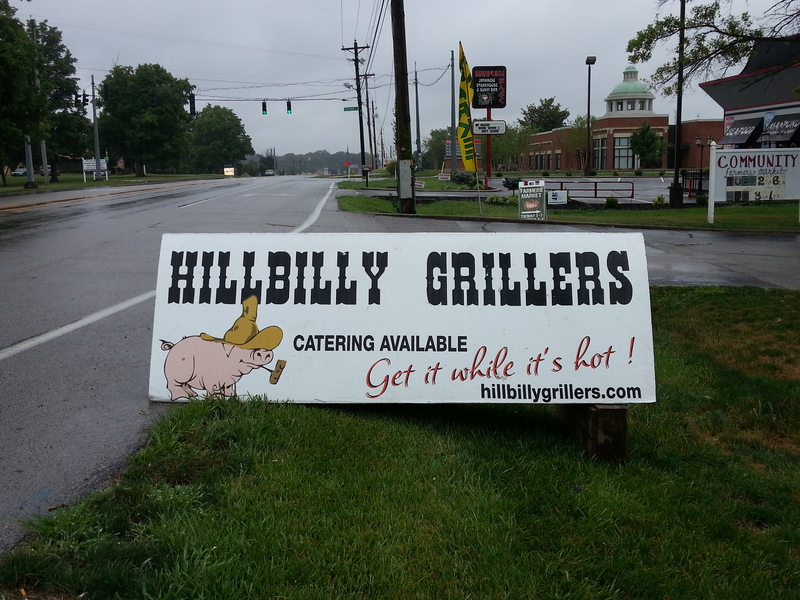 I met the lovely folks of Hillbilly Grillers in Bowling Green, Kentucky, at the community farmer’s market. I pulled over to ask if I could take a picture of their sign for this blog, Before I quite knew what was happening, the grillmaster (I believe his name is JB) had found out I live in Jacksonville and told me about his years in Jax Beach and Ponte Vedra. Then he took me in to meet his partner in BBQ, whose name I’ve unfortunately forgotten but who is so sweet. She also has a sense of humor because she thought it was hilarious that I, a vegan, would blog about bbq signs. Then JB took me out back to meet his brothers, who sell fruits and veggies at the market as well. (“This is more your type of stuff,” he said as he showed me around the displays of produce and flowers.) And all because I stopped to take this picture. If you’re in the great Bluegrass state, first of all, lucky you! Second, if you need any bbq while you’re there, contact Hillbilly Grillers. You seriously couldn’t buy from nicer folks. This entry was posted in barbecue and tagged Kentucky, pigs. Bookmark the permalink.